Kemono Friends was a Japanese mobile game developed by Nexon that launched in March 2015. The game was the first entry in the multimedia franchise of the same name, and like its subsequent counterparts, it takes place in Japari Park, a massive zoo containing anthropomorphized animal characters known as "Friends". In December 2016, Nexon ended the game’s service due to it falling below the company’s financial expectations. As a result, the game is currently inaccessible to play, though all of its story cutscenes and a number of its assets have been recovered. The game was officially described as a "zoo RPG". The player would control their team of Friends to battle swarms of Ceruleans, the enemy creatures that have taken over Japari Park. Along the way, the player would meet new Friends that could be added to their party; different Friends have different abilities, and up to 5 Friends could be used in any given battle. Gameplay missions were punctuated by cutscenes providing story exposition. Chronologically, the game takes place between the events of the manga and the anime series, focusing on the first shutdown of the park. The game’s main story consists of 10 chapters, followed by an additional 10-chapter story and a multitude of optional self-contained side-quests. Footage of a typical in-game battle. The game begins with the player awakening in Japari Park with no memories. They are greeted by Mirai, a park guide, and Serval, a Friend, who explain that the park is currently closed due to an outbreak of Ceruleans. Suddenly, a character named Cerval appears, a Cerulean that looks exactly like Serval. Cerval runs off to return to the “Queen”, and the party follows her. Most of the story consists of the party trekking across the park trying to catch Cerval and reach the Cerulean Queen, while simultaneously fighting other Ceruleans, participating in events, picking up new party members, and learning more about the nature of Cerval and Ceruleans in general. The party is able to defeat the Queen and free Cerval from her control, saving the park from the Cerulean crisis. The story ends with Japari Park reopening, with the player put in charge as the park’s new supervisor. Serval makes a promise to the player that they will go on more adventures in the future. Chapters 11-20, known as the “back scenario”, focus on Serval running away due to her feeling neglected in the presence of Cerval. The story is split up between Serval’s experiences in exploring the park and meeting new characters, and the search party trying to find her. The remaining optional quests contain 88 scenes specific to different characters, as well as several interactions between designated groups of Friends and various quests for special events and crossovers. Notice of the game's discontinuation. 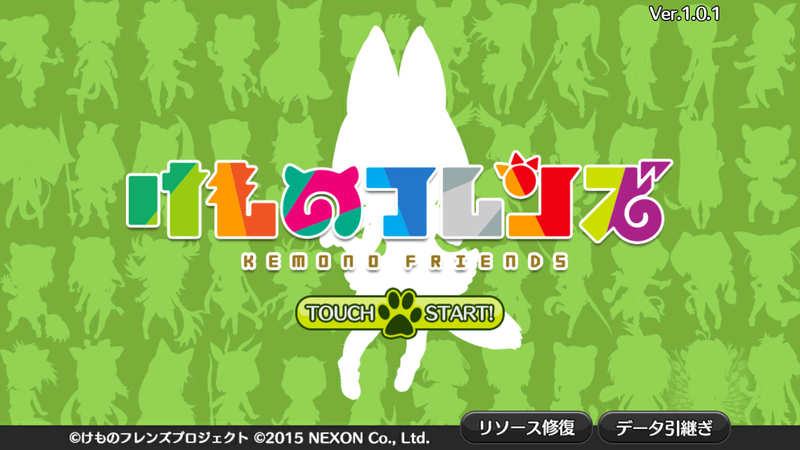 The Android version of Kemono Friends was released on March 16, 2015, with the iOS version following on the 20th of that month. It received decent reception and attracted a sizable user base, but failed to make a larger impression on the public compared with other games of its nature. On November 14, 2016, Nexon announced that the game would be discontinued on the 14th of December, less than one month before the anime series based on it was set to air. After the anime premiered, it unexpectedly ended up receiving immense popularity in Japan. Despite this, Nexon initially stated that they had no interest in re-launching the original app. They later retracted this and said that a future release was possible, but as they have not issued any new statements since March 2017, it seems unlikely (especially after the launch of the franchise's new game, Kemono Friends Pavilion). As the game required the player to be connected to Nexon’s servers to get past the title screen, the cancellation effectively means that it can no longer be played in any form. However, the game’s .apk files can still be found online, and from this, most of its assets have been recovered, including sprites, backgrounds, and music. Additionally, over 20 hours worth of story cutscenes have been recorded and uploaded to YouTube, as well as transcribed. Multiple preservation efforts regarding the game have been launched by fans. In November of 2017, a user named Pokora began recreating the game in Unity using the original assets. However, development is still in its early stages, and the legality of releasing such a project is unclear. Another project from the Japari Library wiki aims to translate the game into English based on the existing footage and transcripts, but this is also far from completion. As such, the only possible opportunity to play the original game would be if Nexon ever decides to officially re-launch it. First installment of Pokora's development diary videos. Pokora's "Kemono Friends development diary"
↑ Archived iTunes page for the iOS version of the app. Retrieved 14 Mar '18. Archived 12 Apr '15. ↑ Archived Google Play page for the Android version of the app. Retrieved 14 Mar '18. Archived 18 Sept '16.